Photos of a new "international version" of the Star Wars AT-TE mega-vehicle have recently appeared on the web. This multi-pack includes 6 action figures, instead of the 1 Clone Trooper figure that it currently comes with. But is this version only for non-U.S. customers? That part isn't exactly clear yet. If you've held off on spending the $100 for this vehicle, you might want to wait a little longer to see if this comes to U.S. stores, possibly as a store exclusive. If you live outside of the U.S. then be on the lookout for this version. 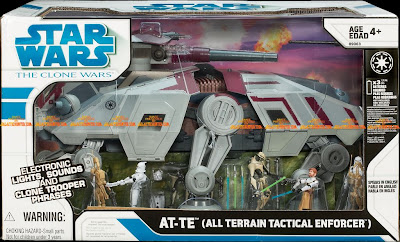 Also, early adopters of the AT-TE may have noticed that it has a slight defect -- its legs fall off far too easily. Hasbro has noticed this defect, and is said to be fixing the problem with future waves. But if you are stuck with one of the defective units, you can contact Hasbro by calling 1-800-327-8264 and they will send you a new set of replacement legs free of charge.